When it comes to season-long fantasy football, you play your studs unless there is an injury or you are loaded at a position and have other studs on your bench. Don’t overthink it. You are playing head-to-head against one opponent each week. You just have to beat that opponent (who also probably has weaknesses in their lineup). Unless you are a huge underdog that week, don’t get cute. In most cases, we don’t touch upon the obvious plays. There are other Start/Sit articles that will tell you to sit a certain RB1 because they have a bad matchup. We don’t do that unless there is some other compelling reason. We also don’t tell you to start Alvin Kamara. That is obvious to anyone that follows football in any form. He is a stud Running Back that gets usage like he is a Wide Receiver. We don’t list obvious plays so that we can look like we are smart when the obvious plays do what obvious plays do. That doesn’t help you. We try to look at some of the plays that are questionable and give you insights on those. Remember to check the news and injury reports, leading up to roster lock for the various game times. Nobody knows exactly what will happen from week to week in the NFL but use all the information and resources available to you to make the best decisions possible for your lineup. Good luck and have fun! The 49ers have given up 905 passing yards and 8 passing touchdowns without forcing a single interception in the first three games of the season. Despite Philip Rivers having his worst game of the young season against the formidable Rams defense, he still threw 2 touchdowns and didn’t have an interception. He is often a forgotten man when talking about the best Quarterbacks in the game, but he just continues to put up numbers. With the emergence of former Top-10 draft pick Mike Williams, it looks like Rivers has a full-arsenal at his disposal. 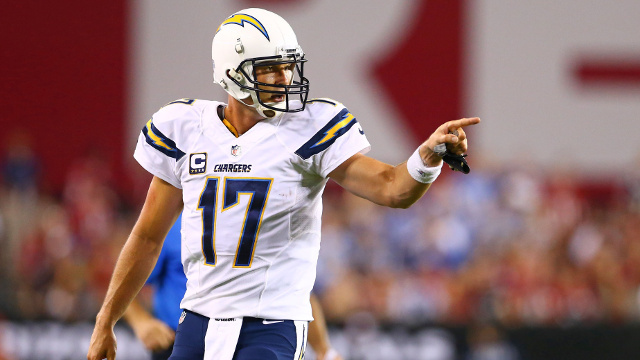 Rivers is currently the 7th-ranked fantasy QB but we seem to find reasons not to play him. Last week, he showed that even in a difficult matchup, he can still hold his own. That showed me that he is an every week starter. Ryan Fitzpatrick’s magic may have started to run out a little bit in Monday night’s game against the Steelers. He did rally the Buccaneers in the second half but his three first half interceptions served as a warning sign and a reminder of what he is capable of. Yes, he has done something no other Quarterback in the NFL history has done with his three straight 400+ passing games. Because he is a career-backup and from Harvard, many people have thought of him as a “game-manager”, but Fitzpatrick has always been a gun-slinger. He can have big games and he can have blow up games. Tampa Bay has no running game whatsoever and I fully expect the ferocious Bears pass rush to tee off on Fitzpatrick. The Bears have 5 interceptions in the first three games of the season. They have also had 14 sacks so far this season. Getting pressure on Fitzpatrick will most likely cause him to make mistakes. I would look for a safer option this week against the Bears. Bernard is going up against a Falcons defense that’s missing key pieces, especially in the middle of the field. This has led the Falcons to give up lots of fantasy points to Running Backs. Jay Ajayi had two touchdowns in week one. In week two, Christian McCaffrey had 14 receptions for 102 yards. This past week, Alvin Kamara one-upped McCaffrey by going for 15 receptions for 124 yards. The Falcons go up against another pass-catching Running Back this week when they face off against Gio Bernard and the Bengals. Though Gio is not in the class of McCaffrey and Kamara, he is a versatile pass-catching Running Back that played every down in Sunday’s game against the Panthers. 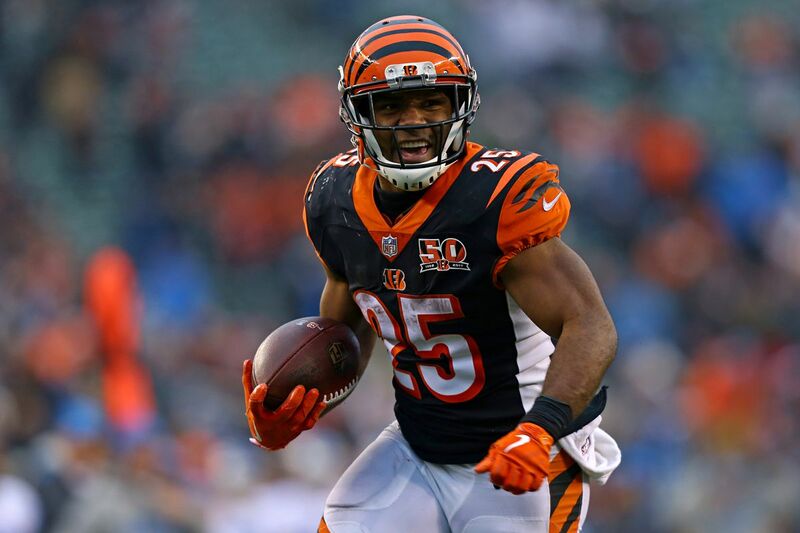 With Joe Mixon out, Bernard is the clear workhorse back for the Bengals. He is also game-flow independent. He might be 11th in ESPN fantasy scoring but that has been because of his multi-touchdown games. He did have two touchdowns in both the Detroit and Cleveland games but if you watched those games, you would have seen that the game flow played into him getting touchdown opportunities. This will most likely not happen against the Jaguars, who have a very stout defense. Crowell may not even be the best Running Back on his team. Crowell and Bilal Powell shared touches in the last game and Powell was more efficient. Last year, Crowell rushed 11 times for 18 yards when he went up against the Jags. I don’t like to bang my head against the wall and that is what it feels like when I roster players against the Jaguars. Only four teams give up more passing yards than the Steelers (Dolphins, Saints, Chiefs, Bucs). 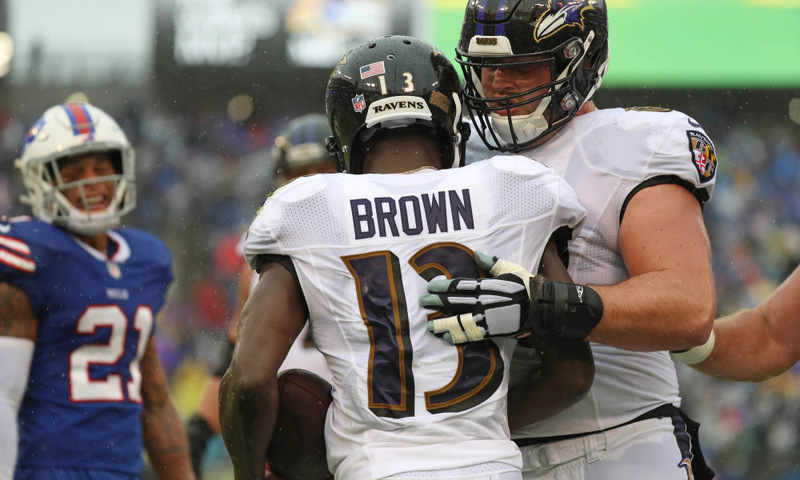 Brown has emerged as Joe Flacco’s favorite target primarily because he can get open. Flacco likes to throw to people who are open. That sounds obvious but lots of Quarterbacks “throw their receivers open” and have a gun-slinger mentality, Flacco does not. One of the ways Brown gets open, as well, is with his blazing speed. Flacco still throws one of the best deep balls in the NFL. Brown leads the NFL in air yards over the past two weeks and is primed for a breakout game against a bad secondary. He has been solid and shown flashes thus far against three teams with solid pass defenses (Bills, Bengals, Broncos). Overall, he has totaled 12 catches on 22 targets for 222 yards and 2 touchdowns. He is averaging 15.4 ESPN Fantasy Points per game. He is a great play this week, especially if you are an underdog in your matchup. A big game is coming for John Brown and what better team to go against than the Steelers. Cooper is a top-tier talent in the NFL but he can’t be trusted in fantasy football anymore. He only had two games last year where he went for more than 100 yards. Yes, he had a nice game in Week 2 but he was non-existent in Week 1 and 3, totaling 26 yards in those weeks. It is almost like Jon Gruden is rotating who gets the ball. Jared Cook was targeted 12 times in Week 1. Cooper caught all 10 of targets for 116 yards in Week 2. Jordy Nelson went for 173 yards last week. Maybe this week it’s Martavis Bryant’s turn? Regardless the reason Cooper is underperforming, the reality is that he is not performing like an every week start. This week’s matchup isn’t easy as the Browns have a strong defense that should be able to get pressure on Derek Carr with a secondary that is opportunistic. 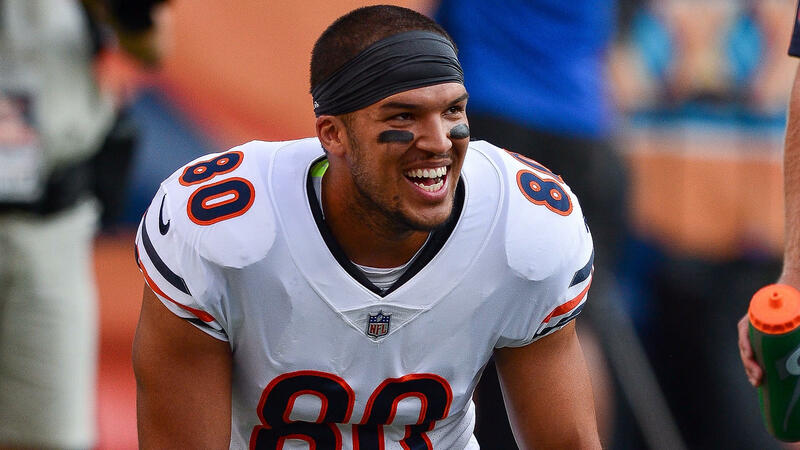 Burton has not yet put up the numbers expected when he signed the huge contract with the Bears this off-season, but there is no denying his talent. With Mitch Trubisky still learning Matt Nagy’s offense, it is only a matter of time before Burton has a big game. In Arizona on Sunday, Burton led the Bears with 55 yards. That is not a lot for a team-leader but it is a step in the right direction. Burton is averaging 5 targets per game with the ability to be a big-play threat. He gets a plus matchup this week against Tampa Bay, who has allowed 19 catches and 250 yards to starting Tight Ends so far this season. Only the Steelers have allowed more fantasy points to Tight Ends this season than the Buccaneers. I know, I know. We all just saw McDonald have an amazing 75-yard reception where he destroyed Tampa Bay safety Chris Conte. That will be on highlight films for years to come. Even though McDonald is good, the reality is that none of us knows which Steelers’ Tight End will have the big game. Jesse James went for 138 yards and a touchdown in Week 2 vs. the Chiefs. Even going back to last year, you probably guessed wrong on which TE would have the better game for the Steelers. Last year, Jesse James had a good game against the stingy Ravens defense when he caught 10 balls for 97 yards in their December matchup. It’s not that I don’t like McDonald, it’s that I also like James and nobody knows for certain what will happen. Recency bias says to roster McDonald. Recency bias would also have had you rostering James in Week 3 and that would have netted you 1 catch for 7 yards. Be cautious with the Steelers Tight End situation, but definitely enjoy watching that McDonald-Conte GIF for years to come. Unless you have one of the top 4-5 defenses that are probably an automatic start each week, then you might want to consider streaming your defense each week with the team with the best matchup that is at home. Remember, low scoring games is not the only factor for a good defense. You can’t predict fantasy defensive scoring but you can predict opportunity. You want defenses that are aggressive and get pressure on the quarterback. This pressure can lead to turnovers. It is also a decent gamble to target defenses going against rookie or inexperienced quarterbacks. Here are three teams that you might want to consider streaming for this week, along with three teams you’ll want to be a little cautious with. Notice that the Broncos and Vikings are normally weekly starts but have been struggling lately and have difficult matchups. Jamy Bechler is a fantasy contributor for CouchPotatoGM and FantasyPros. His DFS twitter is @WinningDFS101 and his website is FantasyFocusFootball.com. When he is not playing fantasy sports, Jamy is an author, host of the “Success is a Choice” podcast, and is a leadership trainer, working with businesses and teams across the country (including the NBA). You can also follow his personal twitter account @CoachBechler. Even though he offers his advice on players and contests, after additional information and consideration, he may end up using different players and strategies than what he recommends. Related Items#CPGMFantasyFootball2018 Fantasy Football2018 Fantasy Football Lineup2018 Fantasy Football Start/SitFeaturedGio BernardJohn BrownPhilip RiversSitStartStart and SitStart Em Sit EmStart SitStart Sit DecisionsTrey BurtonWeek 4 Fantasy Football Lineup DecisionsWeek 4 Start/Sit 2018Weekly Fantasy LineupsWho should is start in Week 4 fantasy?